If you have noticed, we are bringing you even more culinary focused travel posts here at Skimbaco Lifestyle this spring. Stay tuned for many more culinary travel stories, especially from Europe. I am a big believer that food is a great way to travel the world, even if you do it on a school night and at home – or better yet: by hosting a global kitchen party for your friends (did you read the Key West themed party ideas in our latest magazine issue?). I have been fortunate to spend a lot of time in Italy the past two years. It’s the mix of rolling hills, gorgeous coastal towns, the loud speaking Italians do (and the hands speak as loud as the words), the simple farm fresh cooking, and of course the lifestyle of enjoying life in the moment that all together intrigue me. 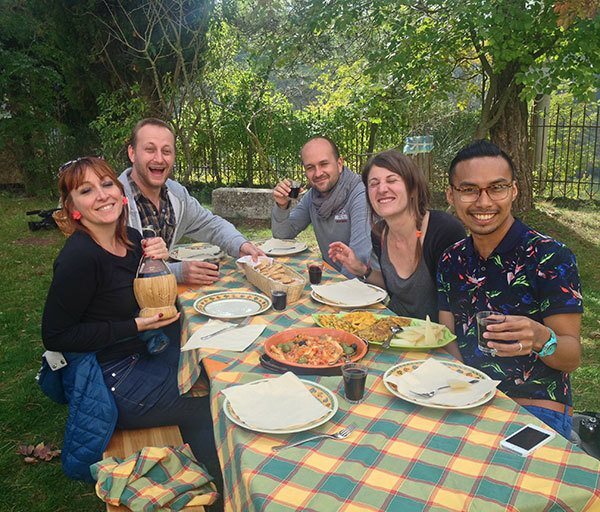 Italy is an amazing travel destination for anyone loving history, or culture, but for me – Italy is all about food, and connecting with Italian people. And what’s a better way to enjoy good food, friends and discussion than having a party at home? I was determined to find out the secrets of hosting a great dinner party at home, the Italian way! In the best party I attended, was in Abruzzo, we all gathered in the kitchen to learn to make gnocchi from scratch. I think we had just opened the second (or the third, but who was counting?) wine bottle, and the kitchen was getting pretty hot from over 15 people packed in, so we opened the window. A few minutes later, a three-man-band showed up and started playing Italian music right behind the kitchen window! The kitchen went absolutely wild! The band moved into the kitchen, we all started dancing and singing, and somehow along the way, the pasta got cooked too. You can’t make this up, watch the video! And wouldn’t you want to host a party, where everyone was having this much fun? 1. Cook with simple, fresh ingredients. Italian food is always fresh, seasonal, and typically simple. 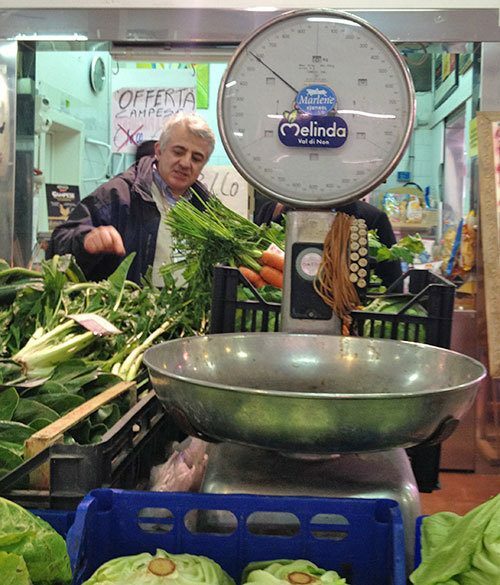 Preparing for the meal starts by visiting local food markets and getting the best possible ingredients. Italian dinners are often seven or more courses, but many of them are very simple, like starting with a plate of cheese, pears and honey, and having dishes like lasagna and desserts like Tiramisu that you have prepared the day before. I highly recommend sticking to simple recipes with fewer ingredients, and allowing you to enjoy the party too, instead of stressing for complicated dishes. Inviting friends over should be about fun, enjoying a dinner together and having great conversations and multiple belly laughs. It’s OK not to have matching plates for everyone, or themed serving dishes or the expensive table clothe. Use what you have, get more plates from the flea market or IKEA and have perfectly mix-matched table. Add some candles, tea candles are cheap, and empty wine bottles serve as great candle holders for long candlesticks and you have great ambiance. Maybe seasonal flowers (grocery store flowers are perfect, even better if you can pick some from your yard), and you are good to go. I love home decorating, but seasonal decorating often can take a lot of time. 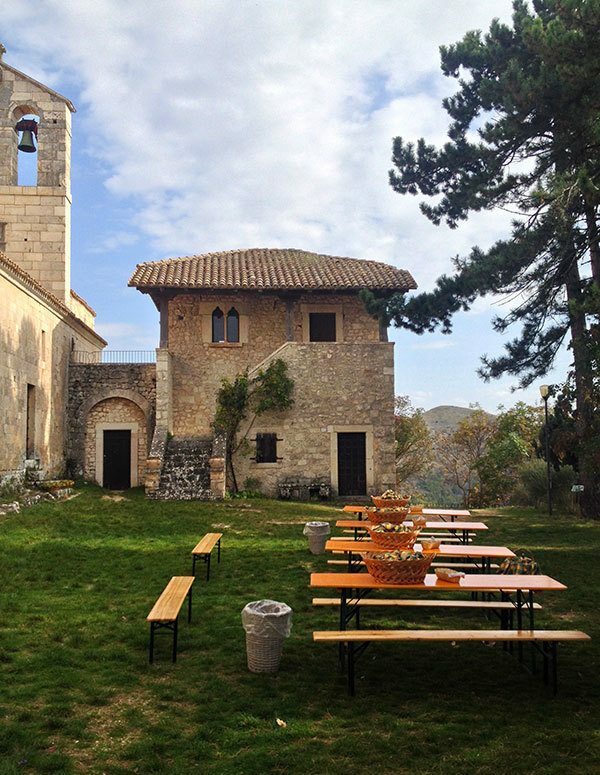 Honestly, none of the parties I attended in Italy were obsessively “decorated,” and simple things like fresh flowers, and candles were often the only party décor. For spring and summer, nothing is better than al fresco dining – take the party outside! 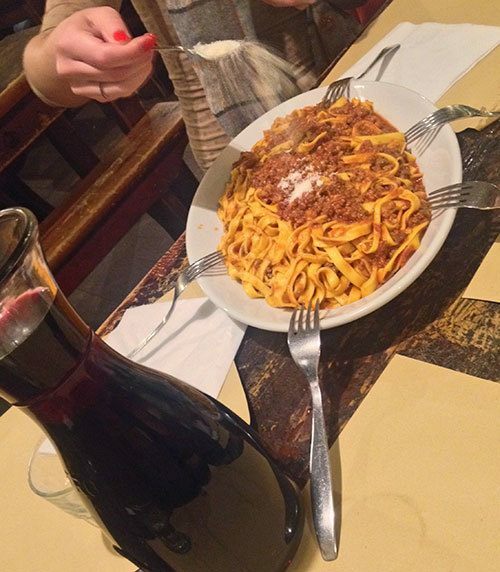 For really good friends… you can even serve food the family-style, like when I had Ragù Bolognese in Bologna with friends. 3. It’s not a minute game. 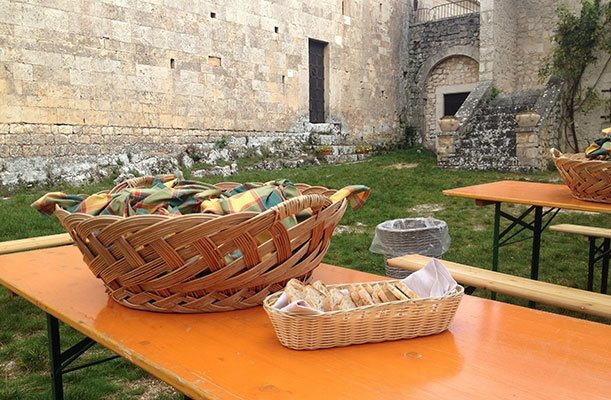 Italians are very “flexible” when it comes to timing, and it’s not considered rude to be late, and the hostesses are not waiting for the guests to arrive with a table already full of food. If you want to host a party the Italian way, let people know when is the earliest they can show up, and when the dinner is actually served. Important note: just remember to open the wine before the guests arrive, because you want the wine to be ready to be served immediately as the guests arrive. You can, of course, have aperativo, appetizers, and Spritz, the popular aperativ of Venice, waiting. 4. Gather in the kitchen. 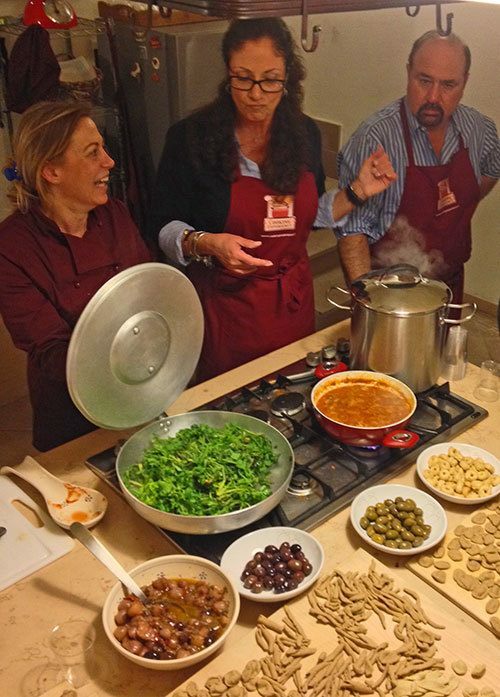 Many people say kitchen is the soul of the home, and the central for the parties, and Italians literally open the kitchen for everyone, and often the guests are invited to help to cook the dinner as well. 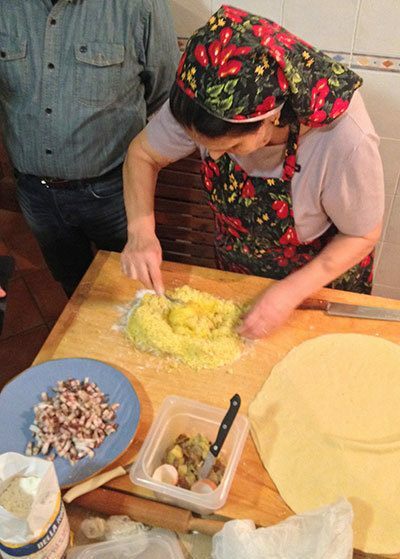 Although, I have met a few pretty protective matriarchs in Italy – protective over their kitchen and cooking! It’s not just the eating together that counts, it’s the cooking together that counts too! The secret ingredient of Italian food is always love. Invite your friends into your kitchen, learn to cook a new recipe together, or ask them to bring ingredients for their favorite side dish. It’s OK your friends see your messy kitchen – getting kitchen messy while cooking with friends is part of a great party. Never underestimate the power of live music. There is always a cover band, or someone’s college-aged kid who needs a few bucks, or a friend of a friend who plays an instrument or belongs to a band. Surprise your guests and yourself in your next party, and get live music for your party. Of course, remember to keep the noise level down, and warn your neighbors. Better yet – invite them over too. In all honesty, I think Italians are more religious about their coffee than wine (no café lattes or cappucinos for dessert! ), but I am sure many disagree. In the house parties I attended, nobody was overly obsessed by wine and food pairings, there was no change in the wine in between the courses, like I am used to for example in France. Most hostesses offered a simple variety of 1-2 different wines. The biggest tip I learned from Italians and dinner party wine: just keep it coming. And wine, of course, isn’t just for dinner parties. 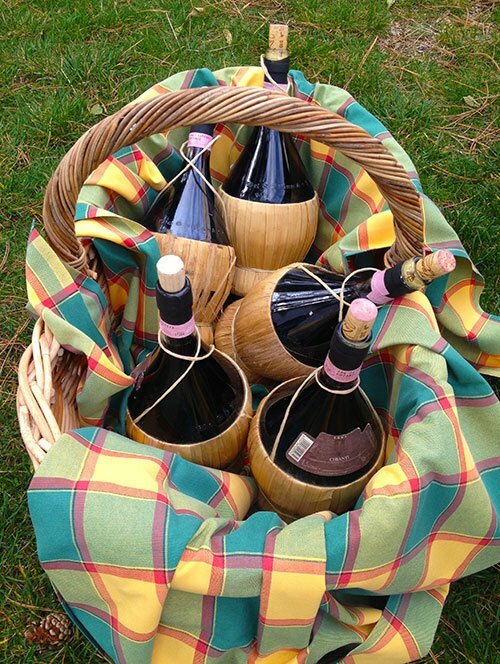 When we had a picnic lunch outdoors, the hostess showed up with a basket full of wine. Thank you for the memories and the tears, this is how I grew up. Christmas eve was always the greatest when I was younger. My mother is half Italian and we always had the feast of 7 fishes. . The house was always full of people and there was always life Italian music. My mother has cassette tapes of a couple of times. Can’t help it. Memories of our special Italian time, awesome people and delicious food keep coming. Take me back now please!!! I feel the same way, I would love to go back. Christmas eve we still do the fish feast but it has been cut down with the price of seafood. Still have our calamari though lol. When I was younger the house was always full, tons of food and music.